Rzeka Wisła Śmiała (54°22'N, 18°47'E) is the middle arm of the Wisła delta. The river narrows at its entrance to a width of 45m. On the E side a breakwater extends 2 cables NNW to Górki Wschodnie Light (54°22,5'N, 18°46,7'E). on the W side, a breakwater extends 1 cable N and a submerged groyne, 3 cables W of the entrace, extends 2 cables NNE, Its extremity is marked by a booy (N cardinal). The costal bank, on which there is a tongue-shaped sandbank with depths of less then 5 m over it, etends about 1¼ miles NNW from the river mouth. The sandbank is subjected to frequent changes after stormy weather. From the vicinity of GW light-buoy (E cardinal), lit between May and September, moored about 1 mile N of Górki Wschodnie Lighthouse (red rounf concrete tower, white galler, 9 m in height) (54°22.5'N, 18°46.7'E) standing at head of the E breakwater, vessels entering the river are advised to streer towards the E breakwater head, leving it at least 50m clear to port. Clearing marks. The aligment (178°) of Górki Zachodnie Beacon (triangulation beacon, square topmark), on then W bank of Wisła Śmiała about 1 mile S of the river entrance, with Górki Wschodnie Lighhouse, marks the W side of the entrance channel, clear of the sandbank farther W. The beacon is not easily seen from seaward. Thence the entrance channel, which lies E of the sandbank, passes between the breakwaters and lead S through a channel which is buoyed during the summer months. The number and position of the buoys varies with the changes in the channel. A light (green round tower, gallery) is displayed from the head of the W breakwater, and a bacon (round orange column), 16 m in height) and a light-beacon (green framework tower) stand on the W bank at the entrance. Shoal water with a depth of less then0,5m extends up to 50 m from this bank. A life boat is kept in readiness on the the W bank near the mouht of the Wisła Śmiała. 1. The permission to enter / leave shall be granted by Harbour Master's Office through communication means; VHF Channel 14 being the basic. 2. 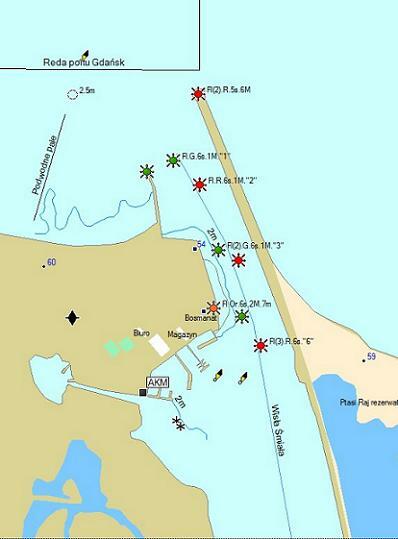 All ships entering / leaving the area of Wisla Smiala and Sopot Molo landing place shall be obliged to receive the permission of Harbour Master's Office.